First courts bailed Damien McLaughlin, who stands charged in relation to David Black’s murder. Then they relaxed his bail terms. David Black, a 52-year-old father-of-two from Cookstown, gets into his black Audi A4 and drives eastward towards to start work at Maghaberry jail. At about 7.30am, shots are fired from a dark blue Toyota Camry at Mr Black’s car close to junction 10 (the Lurgan roundabout). His car veers into a ditch, and he dies at the scene. 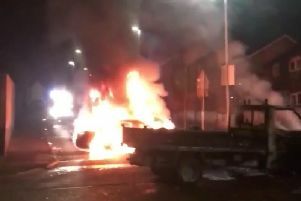 The Toyota is found burnt out in north Lurgan soon after. December 20, 2012: Damien Joseph McLaughlin from Kilmascally Road in the Ardboe area of Co Tyrone, then aged 36, appears in court for the first time in connection with the killing. He is charged with preparation of terrorist acts. A report of the court hearing at Lisburn Magistrates’ Court says he is accused of obtaining the Toyota in Co Leitrim and bringing it to Northern Ireland. His lawyer tells the court there is “no relevant and visible evidence” before the court to link him to the car. McLaughlin is remanded in custody as a crowd of supporters applaud him. As it stands today in 2017, as well as preparation of terrorist acts, McLaughlin is also charged with aiding and abetting murder, belonging to a proscribed organisation (namely, the IRA), and possession of an article for use in terrorism (namely, the Toyota Camry). He denies all of these charges. January 4, 2013: This is the first record the News Letter has of bail being mentioned for McLaughlin. According to court reports, Craigavon Magistrates’ Court is told by McLaughlin’s lawyer that he had a wife and three children, including a six-week-old baby, and that a surety running well into the thousands of pounds can be found to secure bail (a surety being like a deposit to reassure the court that an accused person will comply with bail conditions). Police oppose bail. District judge Alan White rejects the application, saying there is a risk he may offend if released. February 1, 2013: McLaughlin applies for bail again, in order to attend a christening the next day. The court is told that a priest was prepared to chaperone him and that relatives were prepared to lodge £13,000 in cash sureties and property deeds to attain bail. PPS objects, citing police fears he may flee, and Mr Justice Treacy rejects bail. At this time the judge says is “untenable to expect or reasonably contemplate” that bail would be granted by “this court or any court”. May 2, 2014: He is granted bail for the first time at a High Court hearing. It is predicted that it could take two years for the case to come to trial, and so Mr Justice Weatherup says it would be “unwarranted” to keep him on remand until then. Bail conditions are imposed, namely: reporting to police daily, wearing an electronic tag, observing a night-time curfew, and being banned from contacting another named individual. His barrister argues that tagging is associated with sexual offenders and that his client may be stigmatised. According to PPS records, two sureties of £750 are agreed to secure his release. Police object to this low amount. PPS do not. The police have told the News Letter that they strongly objected to bail being granted in the first place to McLaughlin, while the PPS have said they had “continously” raised objections. July 1, 2014: Charges of murder and rifle possession against Sean McVeigh (then 33 and of Victoria Street, Lurgan) in relation to David Black’s death are dropped by the PPS, and he is is released. Noting that he is “totally innocent of the charges brought”, his lawyers announce they will sue the PSNI and PPS for the time he has spent in custody. He had been charged in February, and then released on bail in April. December 18, 2014: According to the PPS, this is the date when a court ordered the removal of McLaughlin’s tag, over the objections of both the PPS and police. June 5, 2015: District judge Peter King tells Craigavon Magistrates’ Court the case against McLaughlin will proceed to trial, telling the court he is satisfied there is sufficient evidence to warrant it. McLaughlin is bailed. November 15, 2015: Fiona McFadden, 30 and of Killough Gardens in Lurgan, is given an 18-month jail term, suspended for three years, after pleading guilty to doing an act with the intention of perverting the course of justice, namely providing a false alibi for her former partner Sean McVeigh in 2012 (over two years before he was found to be innocent of involvement in the killing). Judge David McFarland said her actions had “very little impact” on the murder investigation. January 21, 2016: Mr Justice Treacy allows the number of days he signs bail to be cut from seven to five. According to the PPS, his defence team wanted it cut to three, and they have no record that prosecutors objected to the new five-day rule. Police have said they consistently opposed relaxation of bail conditions (although did not specifically mention this reduction in days). Meanwhile McLaughlin’s requirement to report is removed entirely for the dates February 14 to 17 (inclusive), so he can stay at the Galgorm spa near Ballymena. March 2016: At some point during this month, it is understood his bail was varied so that his bail address changed from one in the Ardboe area of Tyrone, to one in west Belfast. April 12, 2016: Lord Chief Justice Sir Declan Morgan rejects an attempt by McLaughlin’s legal team to apply to the Supreme Court to overturn the order for him to stand trial. August 7, 2016: McLaughlin’s bail is varied to allow him to visit break in the Manor House Hotel in Fermanagh from August 7 to August 9. August 23, 2016: McLaughlin’s 40th birthday. His bail is varied to let him stay at the Galgorm spa from August 23 until returning to his bail address on August 25. August 24, 2016: The Belfast Telegraph carries a picture showing McLaughlin as one of three men holding a banner at a demonstration in Belfast. The banner proclaims support for Arab man Bilal Kayed. According to a report in the Times of Israel the same day, Kayed started a hunger strike after been detained without trial in Israel just as he was due to be released from a nearly 15-year sentence for actitivies with the PFLP paramilitary group. August 29, 2016: Kyle Black, son of David Black, tells the News Letter that “seeing someone that is yet to stand trial in relation to dad’s murder be granted relaxation of his bail to go on a spa weekend, and also attend a republican parade, is very disheartening”. September 8, 2016: The Irish Republican Prisoners’ Welfare Association posts a picture on Facebook showing him holding a placard at an anti-PSNI protest at Woodbourne police station in west Belfast (the picture also shows that another demonstrator is Christopher Robinson, 46 and of Aspen Park, Dunmurry, who was also out on bail whilst facing a charge of murder in an unrelated crime, namely the murder of prison officer Adrian Ismay as a result of a bombing on March 4, 2016). September 16, 2016: Mr Justice Treacy lists McLaughlin’s trial to start on Monday, February 20, 2017, and bails him. This is the last record that the News Letter has of him appearing in court. November 18, 2016: This is understood to be the last time he signs for bail. At this time, his bail conditions are: report to police five days per week; do not attempt to see, speak to or in any other way contact two named individuals; surrender passport and do not apply for a new one; return home each evening on or before 10.30pm and do not leave home in the morning before 7am – and appear at the door during those hours if required by police. December 23, 2016: Police search his west Belfast bail address and find milk a month out of date. Police have not made clear whether or not this was the first time they had visited the property since he last signed for bail. January 3, 2017: Police finally notify the lawyers of the PPS that he is missing, and they prepare a court hearing to revoke his bail. January 6, 2017: A prosecutor tells Mr Justice Treacy in Belfast Crown Court what has happened, and says it is not clear whether or not McLaughlin has absconded. He adds that McLaughlin’s family, including the uncles who have put up sureties for him, cannot help to locate him. When McLaughlin’s legal team are asked to comment, his barrister tells the court “we have nothing to say”. His bail is revoked, and an arrest warrant issued. The above facts have been drawn together over a week or so by going through court records provided by the Courts Service, information from the PPS, and old cuttings of court coverage from the News Letter. After news of the disappearance broke last Friday, the News Letter ran the story on the next available front page. It then did so again on Monday, and again on Wednesday (with Martin McGuinness’ resignation having been Tuesday’s front page) – apparently the only news organisation to realise the full significance of the development. This non-response was then repeated as the News Letter asked more questions over the weekend. By Monday about a dozen questions had been posed to the force, all awaiting answer. Finally on Monday night, they released a statement which said “our priority is to locate Damien McLaughlin” but that “we are limited in what we can comment on publicly due to the ongoing legal proceedings”. Then late on Tuesday, they released another statement saying they had visited David Black’s family in person to apologise. Despite these statements, the PSNI has failed to offer any reasons as to why it did not act immediately after McLaughlin stopped signing bail on November 18, why it did not discover his bail address was basically empty until December 23, and why – even then – they waited until January 3 to tell the PPS about it and get court proceedings under way. Other key questions also remain unanswered, such as whether McLaughlin has another passport which has not been surrendered, or about whether anyone has been disciplined over the case. In fact, by Wednesday, the PSNI were contacting the News Letter’s editor to complain about being continually asked questions. They did eventually put an officer (Detective Chief Superintendent Raymond Murray) up to speak. He talked to the BBC, and the interview ran on radio on Thursday morning. When the News Letter asked if it could speak to him that afternoon, the PSNI said no – because by that stage the Police Ombudsman had started an investigation into their handling of the case, so they could not comment.